Depending on my start date, I will have a bit of flexibility with time to spend in different places and how much I can do other than drive. I am hoping to camp as much as the weather allows for and do at least a couple miles of hiking each day to keep me limber. I will be avoiding interstates where possible but my Miata is pretty comfortable going 80 on cruise control for a few hours so I will use I-40 when needed to save some time. Biggest concerns are finding snow along the way (im on summer tires), mechanical problems (nearing 200k miles), actually getting my car back on time (its in the body shop right now), and getting eaten by a bear or something. But ive done very long trips in the Miata and all of my maintenance tasks are up to date so Im not really that concerned. Anyways, still trying to decide where to blog about my adventure. Might just post to Oppo but I really hate Kinja on mobile sometimes. Either way I need something that I can easily share to facebook so that I can keep my family updated. 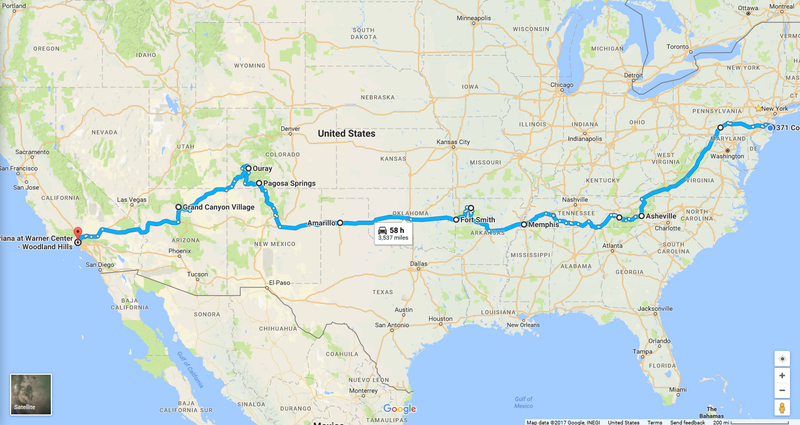 AND if any Oppos live along the route, I would definitely enjoy meeting up for some food/cruising local roads or just some suggestions for places that I should detour to see. This seat is surely going to be fun for 3500 miles of driving lol. Might need a chiropractor at the end of this.. Honestly its no worse than the stock seat though. Driven this for 5 hours and could still walk afterwards. And yes, I have padding on the roll bar now so its not a death trap. Also, for symbolic nature I should start my drive by heading to the ocean (like 15 minutes from home) and then stop at the Pacific Ocean before heading to my apartment in Woodland hills. Maybe even bring some sand with me. Haha im not big on symbolic crap though so I will probably forget all about that.